Artist Angie Wang imagines women in a "casually malevolent" world. 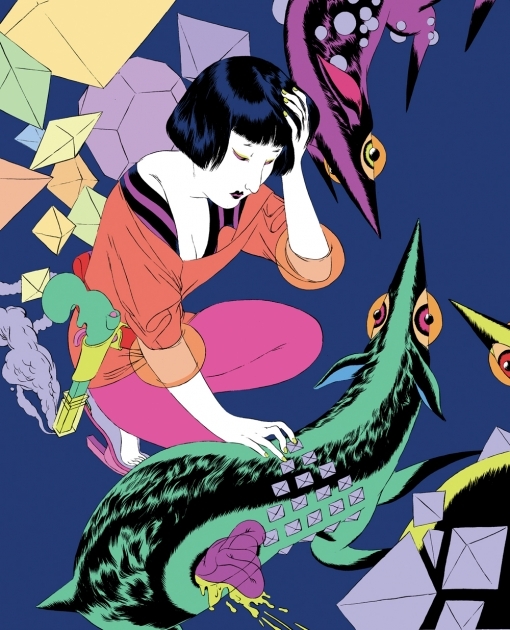 ANGIE WANG describes herself as an "illustratress and cartoonista," a nod to the influence of fashion and comics in her work. The Portland, OR-based artist is compelled by feelings of terror and regret, particularly in horror and science fiction. "I'm interested in worlds where people are overwhelmed by their circumstances, or where they have no way of expressing agency, or where the environment is malevolent—worlds that are oppressive but still complicated and even beautiful," Wang says. Wang uses her graphic palette and bold lines to weave together mesmerizing landscapes.In images such as Cassowary Jones Versus The Frivolous Wolves (2011), women cloaked as wolves bare crystal teeth as they drag away a defeated — but stylish — protagonist. Survival stories also emerge from the tension that Wang explores. Annie Duels The Sun (2010) is based on indie comic publisher Anne Koyama’s experience of undergoing a risky surgery to combat a life-threatening aneurysm. 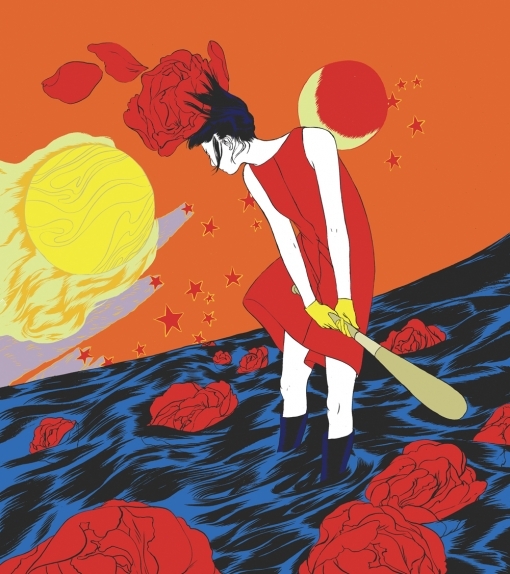 A woman stands in a sea of hair and roses, a bat positioned against a bright yellow sun. Whether they are pictured as active or abject, the women that inhabit Wang’s world are nothing short of fierce. Wang’s Flower Mecha is featured in The Best American Comics 2011. She is currently working on a graphic novel adaptation of The Nutcracker for First Second Books. See more of her work at okchicadee.com. I've read about Wang's Mecha that is featured in The Best American Comics 2011. Can't wait to check the graphic novel adaptation. BTW, the "Annie Duels The Sun" is awesome!